It is not only the goal, but also the requirement at Big Dog & Miss Kitti’s Pet Sitting Services to provide quality, loving and conscientious pet care, but to also ensure the security of our clients’ homes and personal confidentiality. Our quality of service standards are not simply words, they are our way of doing business and will never waiver. be experienced in providing loving and conscientious care for pets and always be aware of the need for safety and well being of both the pets and the clients’ homes. visit the clients’ homes, prior to the first day of services, to acquaint themselves with the pets, client, their home, and to obtain special and/or detailed information regarding services to be rendered. keep all information regarding our clients, their homes and pets completely confidential. 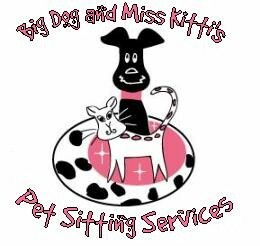 information is to only be shared with the owner and other required staff members of Big Dog & Miss Kitti’s Pet Sitting Services. never make unflattering remarks about other pet sitting industry professionals. reflect complete professionalism when dealing with clients, pets, client’s neighbors, staff and other industry colleagues, to present the sitter and pet sitting industry in a positive and favorable light.